LOUISVILLE, Ky. – Forecastle Festival is spreading holiday cheer to festival goers with pre-sale priced tickets – including access to new festival perks – starting on Friday, December 14 at 10 a.m.
A limited allotment of General Admission, Yacht Club and VIP weekend passes will be available starting at $144.50 + fees via ForecastleFest.com. New this year, the pre-sale will include an enhanced layaway plan that offers ticket buyers the opportunity to purchase weekend passes for less than $38 down, with the remainder paid in installments. Memberships to Forecastle’s acclaimed Kentucky Bourbon Trail outpost, The Forecastle Bourbon LodgeTM will also be available for purchase beginning December 14. New this year, pre-sale Bourbon LodgeTM membership buyers will receive an Urban Bourbon Trail Starter Kit including a copper flask, cocktail stirrer, and more. Additionally, all Bourbon LodgeTM members will receive exclusive discounts and offerings at select Urban Bourbon Trail locations in 2019. All VIP weekend pass purchasers will receive these benefits with their Bourbon LodgeTM membership as well! Also new to 2019, pre-sale tickets buyers will have exclusive access to a limited run of crewneck Forecastle sweatshirts designed by local artist Robby Davis. All ticketing options, including layaway plans and merchandise details, can be found at ForecastleFest.com/tickets. 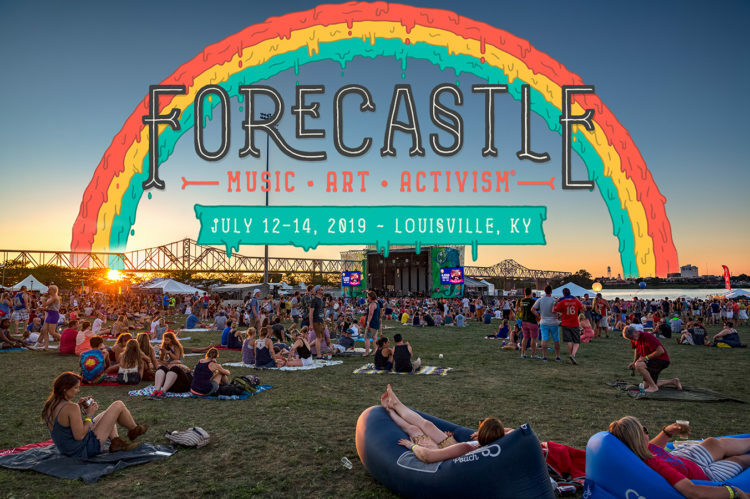 Embarking on its 17th year at sea, Forecastle will return in 2019 from July 12 to 14, at the award-winning Waterfront Park, situated on 85 acres of green space on the banks of the Ohio River in downtown Louisville, Kentucky. The full lineup and details on the 2019 experience will be shared in early 2019. The Forecastle experience presents Louisville’s rich culture through equal parts music, art, and activism®. Beyond the first-class musical lineup, the event showcases the city’s thriving culinary and arts scene, Kentucky’s unique Bourbon heritage and more. Sustainability and conservation initiatives are guided by the festival’s 501c3 nonprofit organization, the Forecastle Foundation.